Joan Miró inspired the Michael van der Ham Spring/Summer 2013 Show. Other Joan Miró-inspired collections : Diane von Furstenberg Autumn/Winter 2007-2008 (look 2 : half a red circle on a black dress, referencing Joan Miró), Diane von Furstenberg Home Spring/Summer 2011 (« Miró Flowers » porcelain plate), Diplodocus Spring/Summer 2011 (Joan Miró-influenced collection), Eley Kishimoto Autumn/Winter 2002-2003 (Joan Miró-style patterns), Fendi by Karl Lagerfeld Spring/Summer 2005 (based on Joan Miró’s color palette), Lanvin by Alber Elbaz Autumn/Winter 2012-2013 (Joan Miró-influenced jewelry, made in collaboration with Elie Top), Pollini Spring/Summer 2006 (Joan Miró-inspired « teardrop » fabrics). Moreover, Joan Miró designed the cover of the Balenciaga’s Madrid exhibition catalogue, in 1974, and the cover of the December 1979 issue of « Vogue Paris » (Joan Miró was the guest editor of this issue). Boris Karloff in James Whale’s « Frankenstein » inspired one T-shirt (look 30) in the Christopher Kane Spring/Summer 2013 Show (the makeup artist of this show, Lucia Pieroni, said that she channeled a daintier version of « Frankenstein’s daughter » to create the makeup). Other « Frankenstein »-inspired collections or items : Dsquared² Autumn/Winter 2010-2011 (this show, influenced by science laboratories, referenced « Frankenstein »), Manolo Blahnik (in May 2006, Manolo Blahnik told « British Vogue » that he designed huge platforms, in the ’70s, that looked like « Frankenstein »), Rodarte Autumn/Winter 2009-2010 (the muse of this collection evoked Boris Karloff in « Frankenstein »). 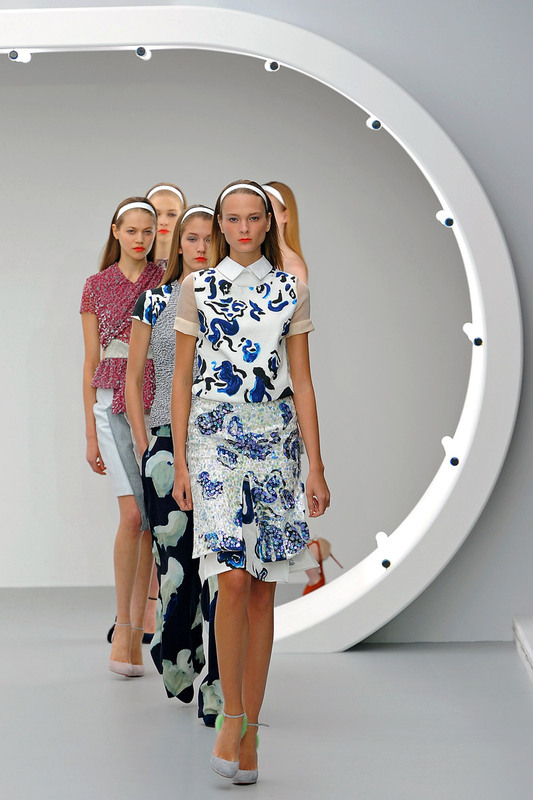 New technologies inspired glasses in the Diane von Furstenberg Spring/Summer 2013 Show, made in collaboration with Google, in order to film a behind-the-scenes documentary, using Google’s glass technology. Some groundbreaking shows or collections inspired by then-new technologies : Alexander McQueen Spring/Summer 2010 (the « Plato’s Atlantis » show, presented on October 6, 2009, at Paris’ Palais Bercy, was filmed by 2 huge robotic cameras, which live streamed the images on the Internet), Alexander Wang Spring/Summer 2010 (in collaboration with Nick Knight’s SHOWstudio.com, this show was projected on a giant screen, in New York’s Times Square), Burberry Prorsum by Christopher Bailey Autumn/Winter 2010-2011 (this show, presented on February 23, 2010, was live streamed in 3-D, on Burberry’s site, facebook®, Twitter and YouTube, for private screenings, in Dubai, Los Angeles, New York, Paris and Tokyo ; moreover, in July 2010, Burberry was the 1st top brand to release a numerical and interactive campaign for this collection, on Burberry’s site, facebook®, Twitter and YouTube), Dolce & Gabbana Autumn/Winter 2010-2011 (this show, presented on February 28, 2010, was delivered live on iPhones, with the D&G Fashion Channel app), Helmut Lang (in April 1998, Helmut Lang was the 1st designer to live stream his new collection on the Internet), Hussein Chalayan Spring/Summer 2007 (the finale of the « One Hundred Eleven » show featured mechanical dresses that transformed themselves thanks to a computer program), Issey Miyake (for his A-POC / A Piece of Cloth line, launched in 1999, in collaboration with Dai Fujiwara, Issey Miyake used groundbreaking technologies to eliminate the usual steps of cuts and sewings ; for his 132 5 line, launched for Autumn/Winter 2010-2011, Issey Miyake developed pieces with the computer engineer Jun Mitani), Jean Paul Gaultier Spring/Summer 2011 (the viewers of this show wore 3-D glasses to watch 3-D printed pieces), Louis Vuitton by Marc Jacobs Spring/Summer 2010 (presented on October 7, 2009, this show was live streamed on facebook®), N° 21 Spring/Summer 2013 (Alessandro Dell’Acqua said that this collection was dedicated to the tumblr. generation), Ralph Lauren Autumn/Winter 2010-2011 (this show, originally presented in February 2010, was projected in 3-D, in November 2010, on the buildings of London’s and New York’s Ralph Lauren stores, to highlight 10 years of Ralph Lauren’s numerical innovations), Rifat Ozbek Autumn/Winter 1990-1991 (this collection was presented as a video, directed by John Maybury, which was then an innovative alternative), Thierry Mugler (in 1998, Thierry Mugler presented the 1st virtual show, at the IMAGINA festival, in Monaco). Moreover, the December 2009 issue of « Vogue » highlighted Google-inspired pieces, created by Gary Graham, House of Waris, Sophie Theallet, Spurr, and Wayne, for the CFDA / Vogue Fashion Fund, in the « Design engineering » article, written by William Norwich. Louise Bourgeois’ « Fabric Works », presented at the Fondazione Vedova, in Venice, were the starting point of the Louis Vuitton by Julie de Libran Pre-Fall 2011 Collection. Other Louise Bourgeois-inspired collections and designs or Louise Bourgeois’ collaborations : Claudia Schiffer (the « spider » logo of her cashmere line, launched in 2011, is based on Louise Bourgeois’ « Spider IV » sculpture), Dior Fine Jewelry by Victoire de Castellane (the inspiration board of Victoire de Castellane’s studio, on rue François-Ier, in Paris, features a portrait of Louise Bourgeois), Dirk Van Saene (in 2005, he said that Louise Bourgeois’ sculptures had influenced some of his designs), Fanny Karst Autumn/Winter 2008-2009 (the cold colors and the steel tints of this collection were influenced by Louise Bourgeois’ works), Frank Tell Spring/Summer 2009 (inspired in part by Louise Bourgeois’ « Cells »), Helen Robotham Autumn/Winter 2009-2010 (Helen Robotham designed this collection, inspired in part by Louise Bourgeois, when she was a student at London College of Fashion), Helmut Lang (Louise Bourgeois appeared on ad campaigns for the designer, and recorded a CD, which was the soundtrack of the Helmut Lang Autumn/Winter 2003-2004 Menswear Show, and that was accompanied by a T-shirt for men, both had designs inspired by Louise Bourgeois’ work, « What Is the Shape of This Song » ; moreover, the Helmut Lang store, in Paris, presented the Louise Bourgeois’ « LAIR 1986-2000 » sculpture, from April to July 2004), Low Luv (in December 2009, Erin Wasson said that she would have loved Louise Bourgeois to wear her Low Luv jewelry line, because she was then « just the coolest thing alive. »), Meadham Kirchhoff Spring/Summer 2010 (the flyers for this show featured a Louise Bourgeois’ quote, « My knives are like a tongue … »), Pon Pon (in 2012, Pon Pon’s creative director, Laetitia Guillet, said that Louise Bourgeois’ drawings would symbolize her brand), Rachel Roy Pre-Fall 2012 (in part), Simone Rocha Autumn/Winter 2011-2012 (influenced by Louise Bourgeois’ works), Simone Rocha Spring/Summer 2012 (based on Louise Bourgeois’ hanging garments and lace works), VPL Autumn/Winter 2008-2009 (the collection was, according to Victoria Bartlett, inspired by « Louise Bourgeois’ glandular and pendulous forms »). Sharon Stone’s character in Paul Verhoeven’s « Basic Instinct », Catherine Tramell, influenced the Julien Macdonald Spring/Summer 2013 Collection, about a powerful woman who lives in a Hollywood mansion. Other « Basic Instinct »-inspired collections : Danielle Scutt 2006 (Danielle Scutt’s graduate collection spotlighted pieces for a strong woman, like « Basic Instinct »’s Catherine Tramell), Salvatore Ferragamo by Massimiliano Giornetti Autumn/Winter 2011-2012 (Sharon Stone in « Basic Instinct » was one of the references of this collection, about some powerful heroines of the ’80s and early ’90s). 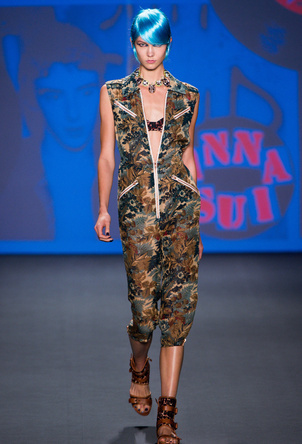 Madeleine Castaing meets London’s and New York’s punk scenes was the theme of the Anna Sui Spring/Summer 2013 Show. Another Madeleine Castaing-inspired collection : Zac Posen Pre-Fall 2011 (influenced by Madeleine Castaing’s interiors).